I found a rather interesting bill the other day. 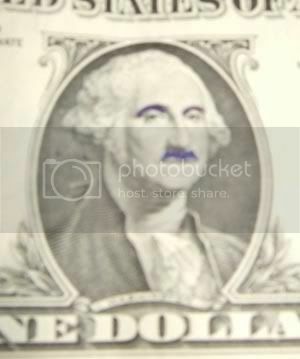 Someone apparently saw fit to make a funny face on the portrait of George Washington. I don’t know who did it or why, but this is the sort of thing you come across when you pay attention to the bills. Mostly, it’s people writing random numbers or letters on the bills, but occasionally, you find interesting stuff. I once saw a bill with something like, “I found Jesus” on it. I don’t really understand what they hoped to accomplish. I’ve never heard of anyone finding Jesus through a message on a bill. It’s also a little disturbing to think that people are trying to use currency to convert people to their religion. My brother and his wife got me a Where’s George? shirt for Christmas. I’ll actually be wearing it for the first time today. I want to see what kind of reaction I get to it. I’m not sure if a lot of people will stop me and say that they’re users, also. I expect to get a few questions about the site, but I get that occasionally because of the marked bills. As for right now, I have some cleaning to do. In the rush of getting stuff moved into my new room, my brother had to move a lot of things into boxes. I’m now going through those boxes to see what I want to keep.